After after bombarding you with sweets lately (not that anyone besides my waistline is complaining), I thought I would offer you a vegetable. But have no fear. This is no ordinary vegetable. 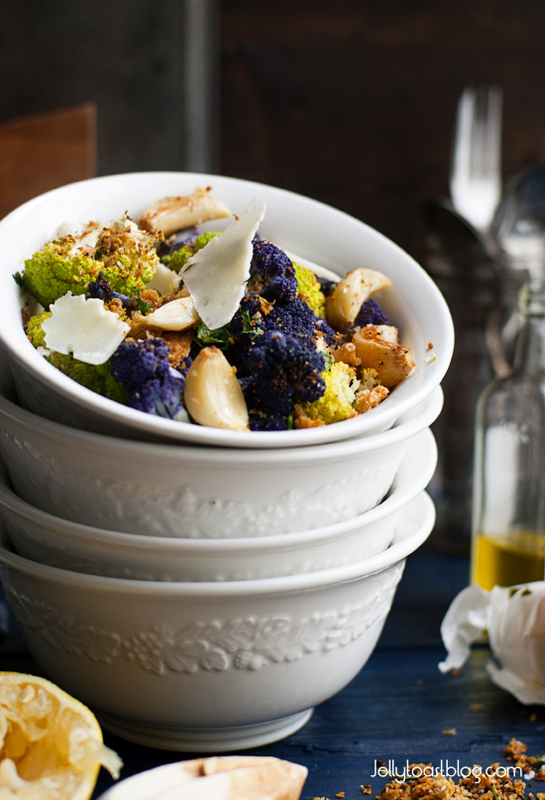 This is a roasty, garlicky cauliflower tossed with lemony herb breadcrumbs and topped with Romano cheese. Yes, cheese. Last week, while strolling through the produce section, I happened upon purple, orange and green cauliflower. Well, the green was technically ‘brocoflower’ but you get the idea. I was inspired to get these, because frankly, I needed some veggies in my life after Thanksgiving’s heavy fair and pretty veggies just taste better. Yes, I’m a child. The kiddos were also interested in these fancy flowers so I let them each pick a color. The Baby picked purple (shocking) and the Buddy picked green – and that’s only because they didn’t have blue. I was unsure how I would prepare the colorful cauliflower (that was almost as difficult to type as it was to say), but thought I would take some help from my olive oil stash from Bumble. I used their knock-your-socks-off balsamic vinegar in my Roasted Brussels Sprouts, so this time I thought I would add some flavor to my veggies with their Tuscan Herb Olive Oil and Basil Infused Olive Oil. Fyi: Both can be found in their Bee’s Knee’s gift set. The roasted cauliflower and garlic tossed with the flavored oils and kicked up herby bread crumbs turned out even better than I had hoped, both warm and vibrant with a bit of crunch from the homemade breadcrumbs. 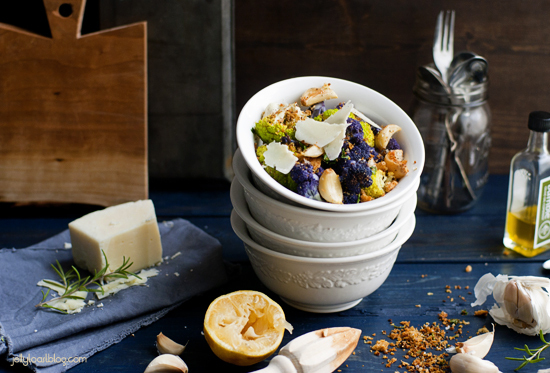 Top it all off with a bit of Roman cheese and you have yourself a killer side dish. Or even a main course. To be honest, I ate a whole bowl for lunch. Which was kind of like a salad if you think about it. **note: This is not a sponsored post, I just love the Bumble oils and vinegars and truly think you would as well so I thought I’d share. You can absolutely use whatever olive oil you have in your house to make this recipe and it will surely be delicious. Cut cauliflower into florets. Spread the florets and garlic cloves onto a sheet pan and drizzle with Tuscan Herb olive oil. Sprinkle with salt and pepper to taste and toss to coat. Roast for 30 minutes or in until cauliflower is tender and golden at the edges. Prepare breadcrumbs: While the cauliflower is roasting, heat 1 Tablespoon of Basil Infused olive oil in a small skillet over medium heat. Add breadcrumbs toss to coat. Add herbs, lemon zest and season with salt and pepper to taste. Saute the breadcrumb mixture until it is warm and toasted; about 2-3 minutes. 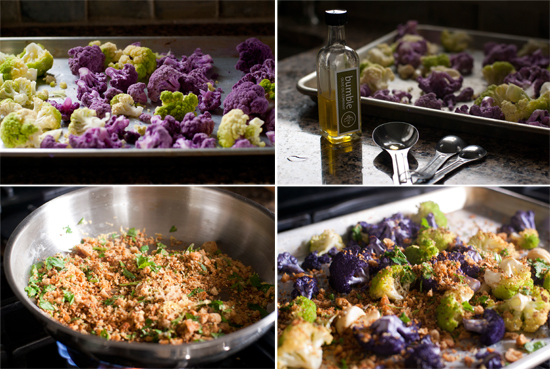 Sprinkle the toasted breadcrumb mixture over the roasted cauliflower and garlic. Toss to coat. Top with grated cheese and serve immediately. Love the idea of adding breadcrumbs. Gorgeous photos! I love the simplicity of roasted cauliflower! 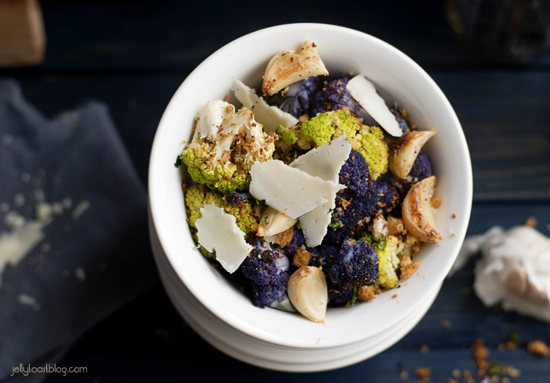 I think roasted is the absolute best way to have cauliflower! I’ve only seen non-white cauliflower once in my life and I just had to try it!